A bridge over the Sierra Huma River, hanging from vertical rocks from the Desfiladero de los Gaitanes (Gaitanes Gorge), a pathway that seems to come from a dream and not from the common need to join two power plans by the shortest way possible. A special engineering that turned fishermen, who were used to hanging from the rigging of their ships, into inland construction workers. Take advantage of our promotions and get your ticket without waiting or additional formalities. The Caminito del rey ( The King’s Little Pathway) is situated along the steep walls of a narrow gorge in El Chorro, near Ardales in the province of Málaga, Spain. The walkway had fallen into disrepair and was partially closed for over a decade. After 4 years of repairs and renovations, the walkway re-opened in 2015. 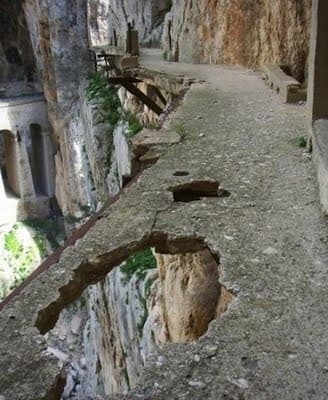 It has been known in the past as the “world’s most dangerous walkway”. Now it’s totally safe! Do you know the history of the Caminito del Rey? The Caminito del Rey used to be a hanging pathway of about a meter wide in the narrowest parts, and about three kilometers long. It runs along the Desfiladero de los Gaitanes, hanging perpendicular over the river and held onto the vertical walls, with an average height of 100 meters above the river. 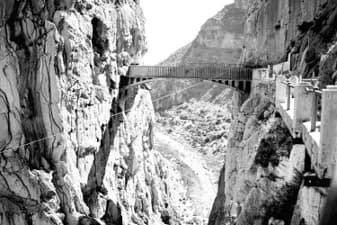 The Camino del Rey was built between 1901 and 1905 to connect the Chorro and Gaitanejo waterfalls belonging to El Chorro Power Plant. The pathway started at El Chorro Train Station next to the railroads, and opened the way from one waterfall to the other for the construction workers and materials, allowing for a better watch over the plant. The problems when building the pathway had to be many, specially at that time. The construction workers had to work hanging from the emptiness, wrapped around ropes tied at the higher part of the cliff. People believe that such work must have been done by prisoners, even death row inmates, the only ones willing to risk their lives in exchange of a reduction in their sentence, or so they say. However, the only thing we know for sure is that this and other works at the dam where done by sailors from Malaga, trained to hang from their ship ropes. When the Conde de Guadalhorce Dam was under construction (1914-1921), visits to the area were very common. The construction site was visited by Rafael Benjumea Burín’s friends and family, engineers, and people interested in the industrial progress of Malaga. The views that could be appreciated from the different parts of the pathway were breathtaking. Benjumea, a nature lover, wanted the pathway to be as comfortable as possible, considering the area’s limitations. Once Rafael Benjumea had decided to improve the pathway, he renovated the bridge between both sides of the gorge. Road engineer Eugenio Rivera designed it. This small bridge is visible from the road that goes from Alora to the Conde del Guadalhorce Dam, and the view of the two stony faces connected by the so called Balconcillo de los Gaitanes (Gaitanes Balcony) is one of the most popular in the province. Like all places that captivate us, there is also a legend about the Balconcillo. Any local resident can tell a visitor the story about the tragic death of a young blond English girl who jumped over the cliff riding her white horse when her life became unbearable. The truth is that despite everyone knowing about the story, no one has witnessed the accident or has been able to date it. It is just another legend to add more color to an already colorful place. 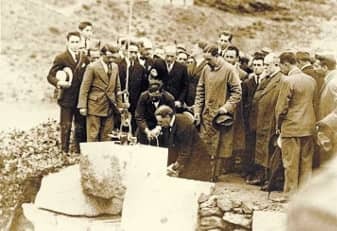 King Alfonso XIII walked along the entire pathway on May 21, 1921 while celebrating his visit to the opening of El Chorro Dam, later to be called Conde de Guadalhorce Dam. Since then, the pathway carries its current name. It started out as a cloudy day, with a series of rain showers that spoiled the inauguration celebrations and made the visit more tedious. It already involved a journey by train and road. Still, the King was pleasant and good humored, and happily listened to all the explanations given by Benjumea about the plant. He wanted to know every detail. Lunch for a party of over two hundred was served. Leading figures, authorities, engineers, and the media were invited. For dessert, the Minister of Development gave a speech where he highlighted the importance of public works and the example that El Chorro Dam represented for the Nation, for balancing the industrial and agricultural industries. After lunch and under the heavy rain, the King placed the last stone. A table and a chair made of the same stone used in the construction were placed for the King to sign the official inauguration document. The official document signed by King Alfonso XIII reads as follows: The Catholic Kingdom of His Majesty Alfonso XIII, on May 21, 1921, all works at El Chorro Dam have been completed and the last stone placed by the magnificent hand of the Spanish Monarch, whose supporters were honored to set their hand after His Majesty. After the ceremony, the King and his companions visited the Gaitanejo Dam and walked through the Balcon de los Gaitanes, decorated with a garland held by four dissected eagles and read: ‘To the King’. Alfonso XIII was so impressed by the view that he asked to be taken a photograph to perpetuate his visiting to the place. The Board of Andalusia closed all accesses after many fatal accidents occurred in 1999 and 2000 and ordered the demolition of the initial part of the pathway to avoid hikers from taking it. The Alora and Ardales Town Halls, as well as many other associations (neighbors, climbers, ecologists, etc.) persistently demanded the restoration of the pathway. In 2007, the initial studies and necessary projects for a full restoration began. Contracts for restoration works were awarded starting in 2014. At the end of March 2015, the Caminito del Rey was finally ready to be walked along once again, this time completely restored and in good condition to now live a 100% safe and exciting experience. Make the virtual visit with us clicking on the signs that appear “at your feet”. It’s worth stopping during your visit and admire the beautiful landscape. Esperamos que tras recorrerlo click a click, tengas aún más ganas de venir a cruzar el Desfiladero de los Gaitanes. Desde La Garganta El balcón del Caminito del Rey estaremos a tu disposición para ayudarte en todo lo que necesites. The opening hours are different during the winter and the summer. In winter, it’s open from 9:30 AM to 3:00 PM and in summer from 9:30 AM to 5:00 PM. Monday it’s closed except in exceptional cases. 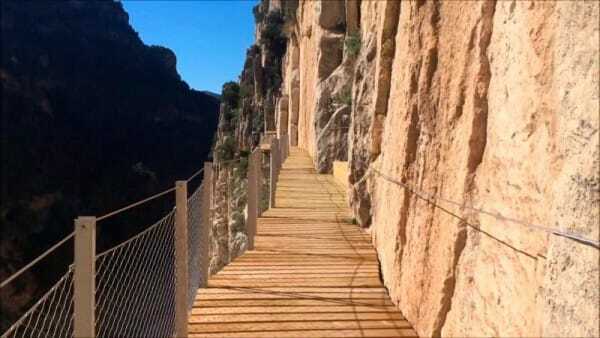 The first day of January and the day 24,25 and 31 of december the “Caminito del Rey” it’s closed too. 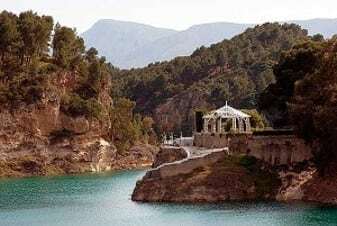 The complete distance of the “Caminito del Rey” it’s 7.7 kilometers so that will approximately last between 2 or 3 hours. Minors must be accompanied by an adult. Access is denied to children under 8 years of age so it’s necessary to present a document of identity at the reception. Due to the quality of terrain, it is difficult to move, something you must be aware of although it is not necessary to be a sportsperson. You can get closer to the Caminito by train if you get off at the train stop of Alora. Anyway you can find all information about schedules on the website of Renfe. If you are more than 15 persons the schedule is different we recommend you to take a look. 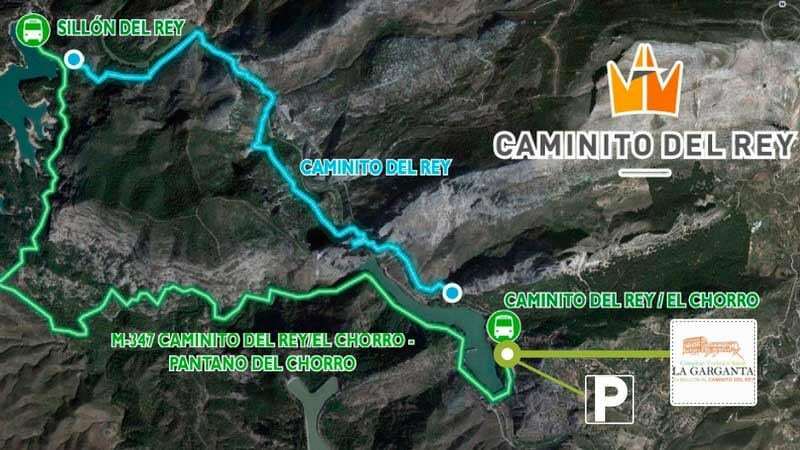 If you go by car we recommend you to park in the northern zone and then take the shuttle “lanzadera” to reach the north access and the entrance of the caminito. It’s the best way to avoid waiting a lot of time for the shuttle to come back. Our rural resort is just in front of the shuttle stop. The best time to book your visit during the winter is 12:00 because you will avoid an agglomeration of tourists. During the summer we recommend you to book the last of the first visits to not suffer from the heat. You can come by train and stop at the train station of the Chorro (Álora stop) and then take the bus. You can also go by car, park in the southern zone and take the shuttle to reach the entrance of the caminito in the northern zone. To take the shuttle we recommend you to look at the schedule but we can say that during the winter it’s from 9:00 AM at 6:00 PM and during the summer it’s from 9:00 AM at 8 PM. We are located just at the end of the path so after your visit you can enjoy of a good tradicional meal in our restaurant and get some rest in our rural rooms with panoramic views. Te ayudaremos a conseguir tu entrada y a planificar tu visita para que no tengas que preocuparte de nada, sólo de disfrutar al máximo.